Beginning his music journey in Chicago at age 8. Bob has a diverse musical background. In 1978 he discovered the mandolin and began playing professionally and became a member of the Atlanta music scene in 1982. His love affair with the mandolin has taken him through many musical idioms including: blues, bluegrass, country, classical, choro, and jazz. 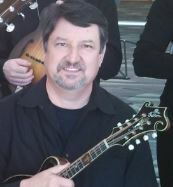 Bob is currently the co-founder and concertmaster of the Atlanta Mandolin Orchestra, where he has performed since 1994 in Performing Arts Centers, Universities, Colleges, High Schools and Retirement Centers around the state of Georgia. Besides his duties with the Atlanta Mandolin Orchestra, Bob was a two term Vice-President and current member of the Classical Mandolin Society of America, and has performed in 125+ member mandolin orchestras all over North America. He has participated in workshops with some of the worlds most renown mandolinists, Carlo Aonzo, Caterina Lichtenberg, Mike Marshall, Peter Ostroushko, Don Stiernberg and Evan Marshall, to name a few. Bob also plays mandolin with some of Atlanta’s finest bluegrass players. Nancy, originally from Southern California, made her way to Georgia in 1998. Her musical background consists of childhood piano lessons, with a smattering of experience on the 5-string banjo. 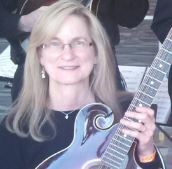 After spending a 20-year sabbatical from music getting her law degree and starting a business, Nancy finally picked up the mandolin at age 40-something and joined the Atlanta Mandolin Orchestra. She currently studies under the tutelage of the exceptionally talented classical mandolin performer and teacher, Chris Acquavella, another San Diego native. In addition to playing second mandolin for the Mandolin Consort of Atlanta, Nancy also continues to play with the Atlanta Mandolin Orchestra. Nancy is also a member of the Classical Mandolin Society of America and has performed in numerous en masse orchestras in North America. When not playing the mandolin or working, you can find Nancy either on a mountain bike or a tennis court. Or, if she’s having a really good day, in the middle of a North Georgia river with a fishing pole in hand. 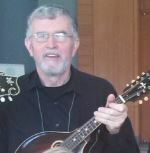 A native of Alberta, VA, although classically trained as a music educator at East Carolina University and Georgia State University, his main musical interest has been the bluegrass genre for almost 40 years. Having eclectic musical tastes, he has played cello in the Southern Crescent Symphony Orchestra, electric bass in the Steve Shivers Trio and Community Bible Church Chapel Orchestra, and mandola in the Atlanta Mandolin Orchestra. Ed spent 37 years as a music educator in Georgia public and private schools and received the Distinguished Career Award from the Georgia Music Educators Association in January 2013. Ed remains active as a conductor, clinician, and adjudicator throughout the Southeastern United States. He now serves as orchestra director at Jonesboro United Methodist Church. Barbara’s love of the mandolin family instruments first began with her playing the mandola in the Atlanta Mandolin Orchestra and the MandoLoar Ensemble in 1994. Prior to mandola Barbara played acoustic guitar and bass. Since then, she has switched to playing mandocello which she says is her real love. Barbara plays a beautiful 1921 Gibson K4 Mandocello that has that sound as when giant mandolins roamed the earth. Barbara is a member of the Classical Mandolin Society of America and has performed in en masse mandolin orchestras all over North America. In addition to playing with Mandolin Consort of Atlanta she has regular duties as principal mandocellist with the Atlanta Mandolin Orchestra. When not playing mandocello, Barbara also has interest in Irish music and plays the Irish Bohdran drum, which we plan to add into the repertoire. Walt is an Atlanta native and 40 year veteran of the Atlanta music scene. Beginning guitar while in high school, Walt was soon playing in neighborhood bands and by the 70’s was working professionally and had decided on a life in music. Over the following decades, Walt has played thousands of gigs of every type, size, genre and venue, and has worked as a guitar teacher as well as doing recording sessions in Atlanta and Nashville. 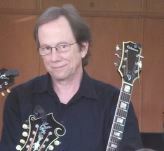 He has studied music and guitar with Atlanta guitar luminaries Bob Shaw at the Atlanta School of Music, George Petsch at the Atlanta Guitar Center, Merrill Dilbeck at Metro Music, Georgia Music Hall of Fame member Graham Jackson, as well as dozens of workshops, most notably with players such as Howard Roberts and Rob Ickes. Walt is currently playing guitar with the Atlanta Mandolin Orchestra and plays dobro with Atlanta’s best bluegrass musicians.